A Twitter Pillow for your Dorm Room? Pillows for your dorm room? For you social media majors….. 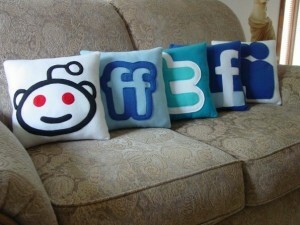 Created by Twitter user @craftsquatch, the pillows produced include Flickr, Reddit, Digg, the Twitter “t”, the Fail Whale, the Twitter bird, FriendFeed, Tumblr, Facebook, MySpace and more. The pillows are available for $18 each in the Craftsquatch Etsy store.